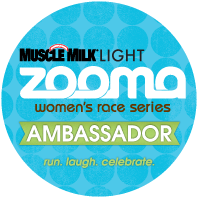 ZOOMA's mission is to inspire women to live healthy, happy and active lives by organizing 5 boutique events across the United States set in awe-inspiring destinations (like Lake Geneva) with a “fit girls’ weekend” atmosphere. ZOOMA Great Lakes Half Marathon and 5K will take place Saturday, October 20, 2012 at The Abbey Resort and Spa in Fontana, Wisconsin – Lake Geneva (90 mins from Chicago/ 45 mins from Milwaukee and Madison). If you're in the Chicago area, or would like to travel to this great destination, come join me! With this promo code GLAMB6 you get $10 off the half or $5 off the 5k registration. For more information and to register, check out zoomarun.com. Are you planning to run in a ZOOMA event this year? Yay! I'll see you there! I would love to come do this one (even though there is one right in my backyard in Annapolis! ).